Los Santos (Guatemala / Washed) - Harvest Season: Early Spring 2018 - Back for year two and very comfortably settled into the blends at this point in the year. 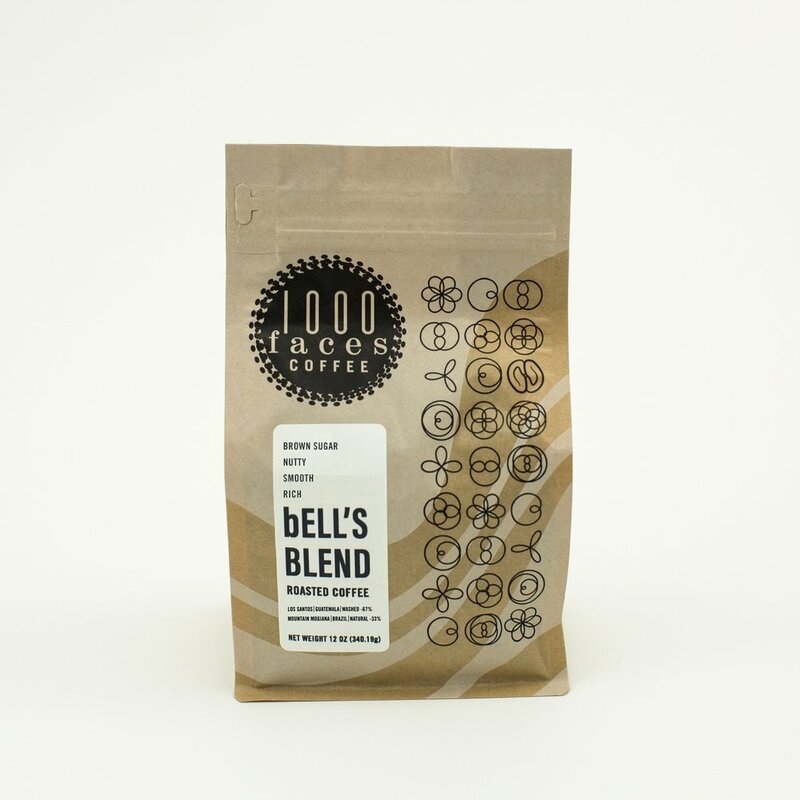 We source this coffee through Luis Pedro Zelaya Zamora and his mill in Antigua, Guatemala - Beneficio Bella Vista. Los Santos is a blend of coffees from farmers in the Chimaltenango region. This is a clean and classic Guatemalan coffee flavor profile - red apples, chocolate, toffee, brown sugar, brown spice. Mountain Mogiana (Brazil / Natural) - Harvest Season: Late Summer 2018 - New to the blends! This coffee comes to us from our long time friends and oldest partnership to date, Fazenda Ambiental Fortaleza. Mogiana is the name of the region surrounding FAF’s personal farm, and Mountain Mogiana is a blend comprised of the families’ coffees living in this area. Mountain Mogiana is consistently known for being incredibly sweet and full bodied - almond butter, chocolate, vanilla, nougat, grape. With Los Santos taking the lead, bell’s blend is absolutely remaining consistent in its trail mix flavor profile. This coffee is providing a deep brown sugar sweetness, mild apple apple acidity, and lots of chocolate flavors. The Mountain Mogiana adds a touch of complexity with hints of nuts and dried berries. Overall, it’s tasting clean and sweet and highly drinkable - we’re tasting chocolate, brown sugar, vanilla, almond butter, apple pie, golden raisin, dried berries. If under extracting, you can expect a very lackluster cup - dominant nutty flavors, lack of sweetness, thin body, grassy. If over extracting, you’ll find that the chocolate flavors become overly dark/bitter/drying and mute any other subtleties. So good with milk! The flavors work quite harmoniously to become even denser and sweeter - hazelnut, vanilla, marzipan, marshmallow. These two coffees are playing very nicely together at a 50/50 ratio. Both bring different types of acidity and sweetness to the blend, producing a saturated and complex flavor profile. Mountain Mogiana provides both a heavy nut butter body and a bright cherry juice acidity. Los Santos is filling the spaces in between with clean hints of chocolate, vanilla, and brown sugar. With the slightly higher percentage of Mountain Mogiana here, in comparison to bell’s, we’re finding that Savio has a denser body and slightly brighter, fresh berry flavors. The ideal extraction should produce a shot with a full body, long aftertaste, big sweetness, and juicy acidity - cherry, apple, dark chocolate, brown sugar, hazelnut, vanilla. If under extracting, you’ll find that the coffee is far too citric acid forward - sour, aggressive, lemon, lime, green apple, short finish. If over extracting, you can expect any fruit flavors to be buried underneath a good amount of bitterness - roasted nuts, raw cacao, burnt brown sugar, dry finish.